Beth Bee Books is my micro-press. I design and assemble the books myself. This site is currently being remodeled! In the meantime, check out information about Beth Bee Books found at bethbee.etsy.com. Beth Bee Books evolved from books I threw together from found materials for my own use and gifts to friends in the late 1990s. I found that people liked the design and aesthetic of my books, so I slowly moved toward making them with more polished methods in numbers that I could sell to others. 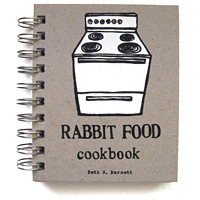 Rabbit Food Cookbook was first published in 2002. In high school and college, I had published a few zines, and the cookbook was initially produced like a, photocopied hand-cover zine. From 2002 to 2006 I continued to produce the books in this way, creating about fifty at a time, with a lot of hand assembly including sticker-sticking for the tabs, hole-punching, cover-cutting out, stamping, and coallating. About 250 books were produced in this way. Cookbook with 82 strict vegetarian/vegan recipes and additional resources relating to food history and a healthy vegetarian/vegan lifestyle. Over 250 pen & ink and block print illustrations, hand silkscreened covers, wire-o lay-flat binding, and six very cute die-cut cardstock divider tab pages for easy access to the recipe sections. Published and printed in the USA / Portland, Oregon! The book still required a lot more hand work than is conventional for printing in the US, especially in a short-run printing, but I wanted to keep the design I'd already established and keep the production in North America. It took a while to figure out how to do this and still keep the retail price reasonable—through my research I found that almost all books with handwork details, dividers, etc. are being produced in Asia. Most printers I contacted in the US wouldn't even work up a quote for my small, specialized project! At long last I found printers and a bindery in Portland to work with and in 2007 I produced a new edition of the book in in an initial run of 500 and established Beth Bee Books as an official publisher. In 2008 I printed a second run of 500 of the same edition for 1000 total copies made of the 5th edition. Also in 2007, I developed and introduced the first Blank Recipe Books, and I opened my shop with etsy.com featuring these blank books as well as my small card-file style address books. Since I opened the etsy shop, the books have sold steadily, I have introduced a few new designs, and I have sent books to customers all around the US and in countries all around the world. First size produced of the blank recipe journal book with 8 tab dividers that are illustrated with block prints. This book contains 100 sheets of 24# partly recycled paper, Hand screenprinted Davey board covers (a recycled material), die-cut cardstock section dividers, and 1" loose-leaf binder rings for binding so the book lays flat. Book rings can opened and pages can be rearranged. Compatible with standard 4in x 6in recipe cards as well. 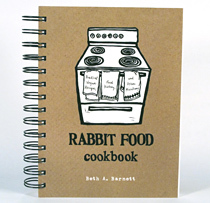 In 2011, the opportunity presented itself to work on a new edition of Rabbit Food Cookbook with Sasquatch Books, a publishing house located in Seattle, Washington. I love the handmade look of the 5th edition, but my ability to make many copies and distribute them effectively has been limited. I decided to go ahead and put Rabbit Food in Sasquatch's hands. Five thousand copies were produced. The Sasquatch edition has several new recipes and some updated content from 2007, but in the end a number of the special details of the book design I had hoped would remain were cut for cost. Cookbook with 94 strict vegetarian/vegan recipes and additional resources relating to food history and a healthy vegetarian/vegan lifestyle. 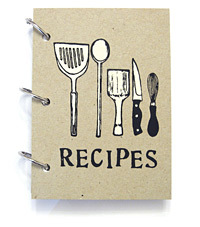 Over 250 pen & ink and block print illustrations, helpful wire-o lay-flat binding, and section divider pages with a helpful black ink "bleed" along the side to help you find your way between the recipe sections. In 2012, I introduced my very popular 5in x 7in sized blank recipe book, and in 2017 I added additional blank journals in the same size. Check out avaiable books for sale in my shop at bethbee.etsy.com.